Location-based marketing provides a means to interact with your guests or customers through social media while they are at your location. 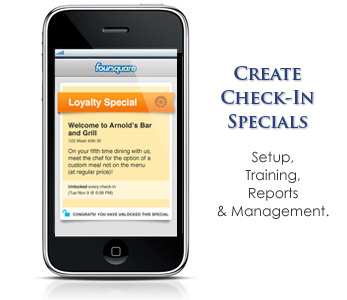 Mobile check-in specials provide operators with tremendous opportunities to enhance the guest experience and increase revenue. When a guest “checks in” using the Facebook App on their mobile device, you can greet them with a special offer you’ve added to your company's business Page. This check-in is added to the "Wall" of their profile which provides a link to your business Facebook Page and a message "__________ is at [ your business name ] essentially providing a work-of-mouth referral to their entire network of Facebook Friends. Repeat - providing word-of-mouth referral to dozens or hundreds of Facebook friends! View our work. Foursquare launched in early 2009 with limited availability in only 100 worldwide metro areas. In January of 2011, they eclipsed 1.2 million check-ins per week. Foursquare allows users to share their location with friends by “checking in” via a smartphone app or by text message. Points are awarded for checking in at various venues. Users can choose to post check-ins to their Twitter and Facebook account, notifying their social network and sharing your business name to all of their friends! By checking in a certain number of times, or in different locations, users can collect virtual badges. In addition, users who have checked in the most times at a certain venue will be crowned “Mayor” until someone surpasses their number. Various venues have embraced Foursquare, and offer special deals to users who are “mayors”. Check-In specials reward users with a special offer for promoting your business to their valuable network of social media friends and followers. Common specials include a "First-Time Special, Loyalty Special, Swarm Special" (check-in with 3 or more friends at the same time) and many more.